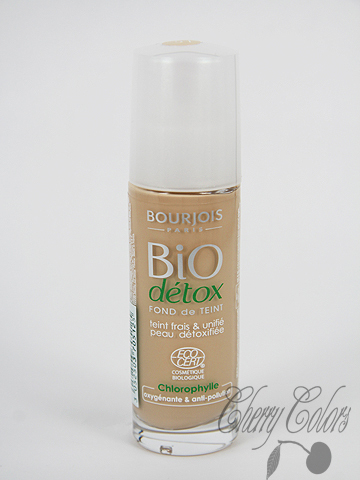 Review: Bourjois Bio Detox - Cherry Colors - Cosmetics Heaven! I promised you a review of the newest foundation by Bourjois, named Bio Detox. It contains chlorophyll and well even if it says why, I really don't think that would work that way, lol. But I really like it has an EcoCert certificate (98.8% of the total ingredients are from natural origin, 21.9% of the total ingredients are from Organic Farming). I have combination skin , which gets oily on the T zone really quickly so I was eager when I heard of a matte finishing foundation. WOW! Anyway, since there are SO many bad reviews on the Internet about it, I wanted to share my opinion. Anyway off to the review! This foundation perfectly evens out the complexion, minimizing pores' appearance and concealing imperfections. Enriched with chlorophyll from plants that brings oxygen and filters pollution, it leaves the skin pure and fresh. Its formula melts onto the skin for a no mask effect. The package is a lovely glass like bottle, with a pump applicator on top. The bottle itself is not heavy as I thought when I read it's made from glass. It does a really good job, because you can control how much foundation you want to use. 1 pump is for your whole face (if you work really quickly). I usually squeeze a small amount of foundation on my outer palm and then put the cap back on. That way the package never gets dirty, like some people reported it does. Plus I like the design, so sleek, but I wish it would be cuter. The texture is creamy at first (when you get it out), but after you start working it onto your skin it becomes thicker and harder to work with. It kind of reminds me of some BB creams. That's the reason why I apply it using ONLY the stippling brush, and really quickly also. I tried it with sponges, foundation brush and my fingers. It was a nightmare with them all. With the sponge it dried so quickly that it left patches behind. With my fingers, the application was uneven. And with the foundation brush .. oh well, it was the worst of them all. I got left with multiple lines that had more foundation that other parts, which resulted in an uneven coverage. Anyway, the foundation starts to dry really quickly (seconds! ), leaving you with a soft matte finish. The coverage is medium, but buildable. People say it smells like apples, but to me it smells like baby powder with a hint of something acid in it. Weird, and not so pleasant. Luckily the scent disappears quite quickly on your skin. I used this foundation on several times, and after I learned how to use it (apply it as quickly as you can, finishing the lines around your nose with your finger), I absolutely loved it. Before this I was using some thicker BB creams, but none of them dried so quickly on my skin. The foundation lasts on me for the whole day, but my oily zones need to be re-blotted after about 7 hours (if I don't use a finishing powder after the foundation, if I do.. well then it lasts for 12h+!). I really wouldn't recommend it for dry skin type. It's way too drying, even for my combination skin. Well at least on the normal/dry areas. It gives me a smooth finish, making my skin look flawless (well almost). It doesn't cover black circles or super red pimples, so a concealer is still needed. Sadly I think it also breaks me out, although since I started using another face cleanser it's getting better. I don't get real acne from it, but those small tiny bumps, which aren't visible (to most people that's it), but are there. Of course I will continue to use it until I finish it up. By then I hope they'll fix the formula or something. Plus, it makes my wrinkles show up more :(! -(28.02.11) I realized it breaks me out badly. Overall: Even if I absolutely love this shade (I realized my skin tone is neutral and not pink), and the finish (matte), I'm not sure if I would buy it again. I probably would, but I honestly hope they could do something about the formula (thick and hard to work with). I like it, yes but it could be better. I wouldn't recommend it, simply because most people think it's a hassle to use a stippling brush to get that perfect even coverage. Plus it's really not appropriate for any other skin types than combination and oily. Sad, but true. So.. I like it, but wouldn't recommend it.